A few recent comments have pointed out that the reports as they stand at the moment include everyone at level 80 regardless of gear level - from players that 'just dinged' seconds before my spider saw them all the way through to those who have been raiding since the WotLK launch-week. Gear scoring is something I wanted to use to extract different groups of players in the past, but I've finally got around to implementing it. All items in the game have an internal 'item level' attribute as well as its more widely known rarity value (uncommon, rare, epic etc. ), generally the higher value the item the higher the 'item level'. There are even achievements[1,2] linked to the 'item level' of your gear. The simplest way to create a 'gear score' is just to add up the 'item level's, if you want to make it more fair/accurate include a factor/multiplier based on rarity - giving an epic item a higher score than a rare item at the same 'item level'. Be Imba! - Their score includes Gear, Gems and Enchants. I'm not particularly interested in Gems & Enchants; I'm looking for a way to discriminate on Gear-only. Warcrafter - Similar to Be Imba! their score appears to include Gems and Enchants as well as Gear. GearScore (addon) - A pretty interesting spin on gear scoring, it works by adding up at the stats (+sta, +agi, +spell power) provided by the gear regardless of the 'item level'. FuBar_GearRating (addon) - An inactive project, but still works with the latest FuBar on patch 3.0.8. It multiplies the 'item level' with a few factors including the rarity, slot and class of the character (e.g. a Hunters ranged slot item is more important than an idol/relic/wand slot item). 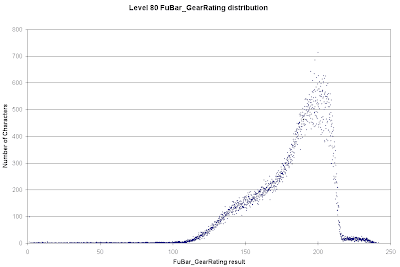 The method used by FuBar_GearRating turned out to be my favourite approach. I am not interested in Gems or Enchants, they are more indicators of the gold the characters are willing to spend than the gear level they have access to. I implemented the same algorithm used by FuBar_GearRating in my character database, a quick sanity check proved the score I came up with matched the addon's in-game results. Next, I ran it on 249,882 level 80 characters and I got the following results. There are 64,676 characters (25.8% of the sample) with a score of 200 or more, only 3,463 of those have a score of over 215. The long tail of characters with a score of less than 100 appears to be those who are practically naked or wearing RP outfits and the like. Overall I am quite happy with the results, I'll be using this new data to partition the reports I generate. Also a recent brainwave concluded that anyone with a Resilience of over 200 is probably spec'd/geared for PvP and should also be in a separate report. I am very interested in the scoring alorithm. Any chance you can post it or explain in more details?